Hand-laid Track, Here We Come! Before I left for home to be with family for Christmas, I had another point rail on an Atlas Code 55 turnout break. The stamping process appears to leave a weak spot right where the point rail connects to the throwbar, and some of them tend to break. This is the third of this type of failure I’ve seen, and this makes me suspicious that it may be a common problem. Combined with my frustration at the complete lack of Atlas C55 availability, I’ve decided it’s time to make some changes. A few hours before leaving for Iowa, I bit the bullet and ordered a #7 Fast Tracks turnout building kit and associated hardware. I’ve heard nothing but good things about these guys and decided it was time to give it a shot. It’s a little pricey to get started, but once I have the jigs and tools, I’ll never be beholden to any company not having track piece X in stock again. Plus, I’ll be switching to Micro Engineering C55 flex track. 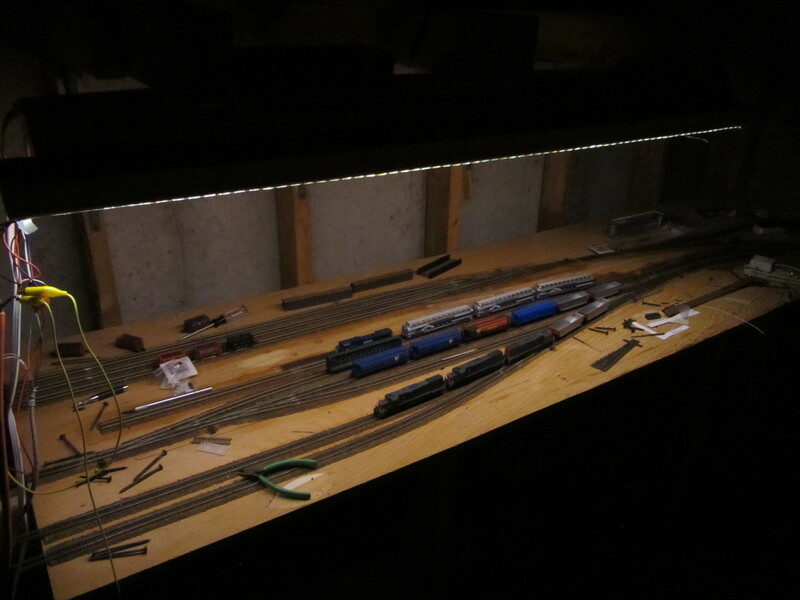 Visually it’s on par, if not a touch better, than the Atlas flex track I already have and the rail will then be identical to my new turnouts. I don’t like the more rigid design, but it’s made in the good ol’ USA and – surprise – you can actually get it. The kit should be waiting in the mail when I get home, but I’m still missing a few things like the files that won’t show up until tomorrow. Hopefully by the end of the week I can actually try out building a turnout and I’ll post again with my thoughts and results. 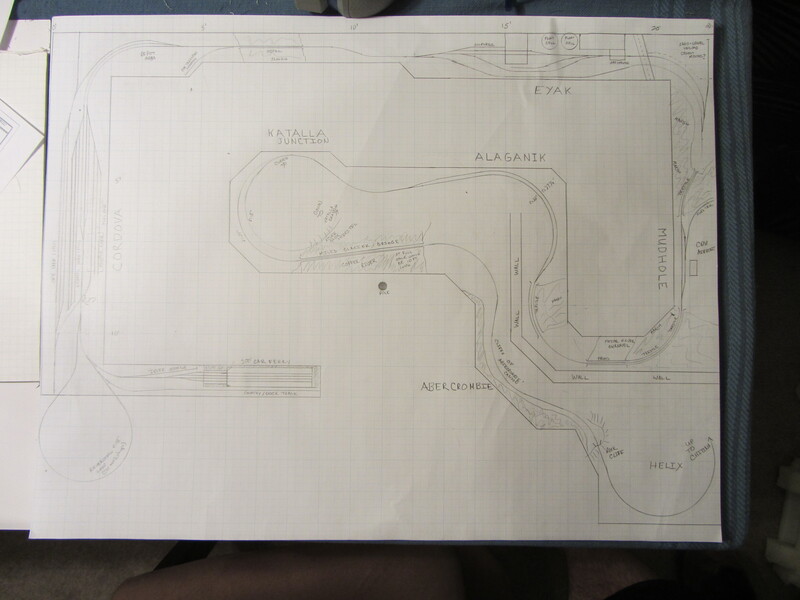 This entry was posted in Planning, Trackwork on December 30, 2013 by ndholmes. While I was in Indianapolis, I received a call from DHL… They had a box from China, and I hadn’t been home for the first two delivery attempts. Woohoo! 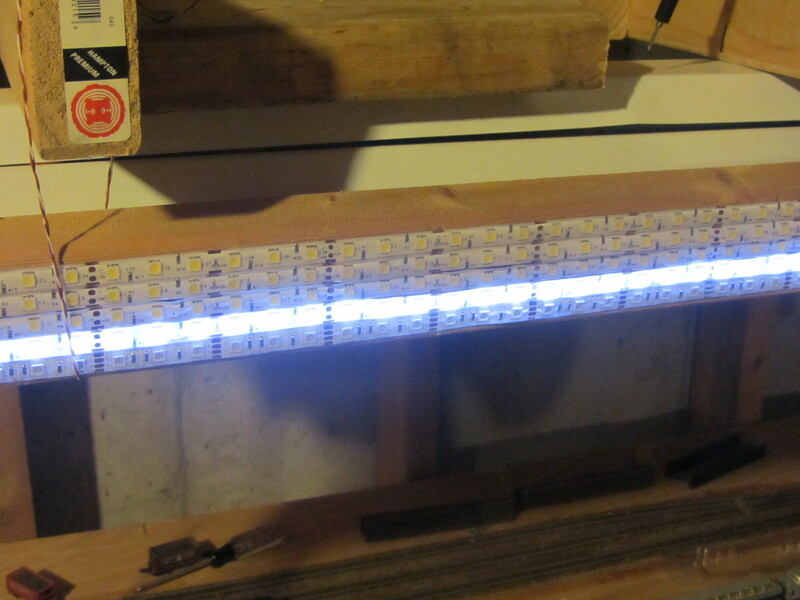 The LEDs for lighting the layout arrived (all 500 feet of warm white and 250 feet of cool white) early! When I arrived back in Colorado (which turned out to be a long and annoying tale on its own – thanks a lot, United…), the other piece of the puzzle was in the mail – an RGB LED strip. 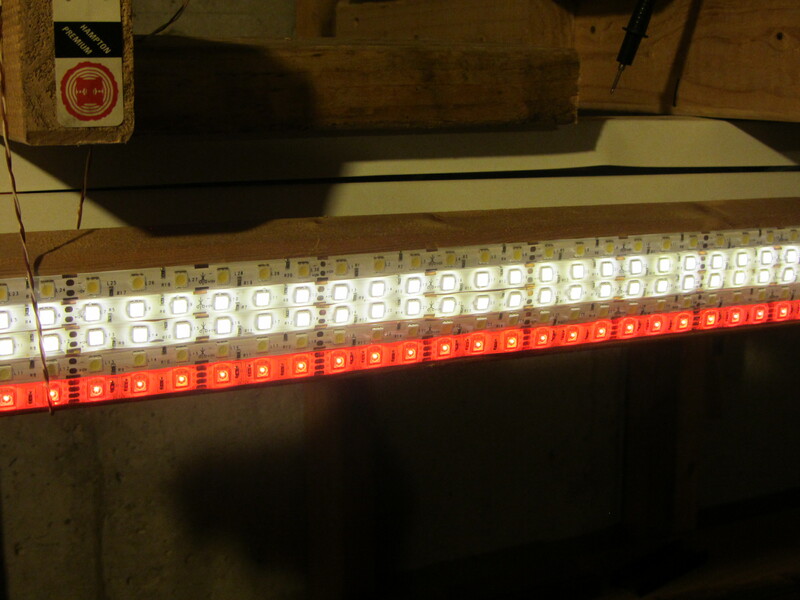 As you’ll recall, my plan was to combine two warm whites, a cool white, and an RGB strip, so that I can vary both the intensity and color of layout light. 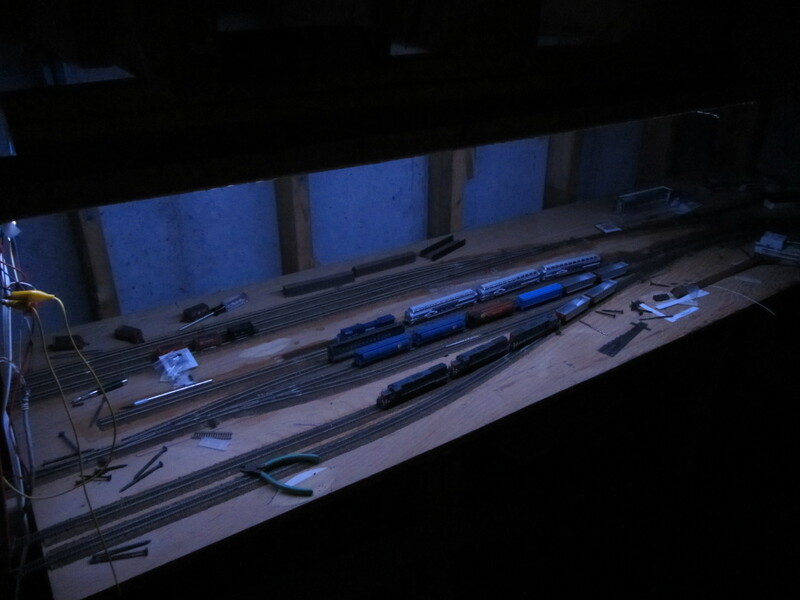 Eventually, I plan to integrate that with the fast clock system so that over the course of an operating session, the light will change to model the real change in daylight. While I want to get going on benchwork again this weekend, I couldn’t go get more lumber because it’s (quite unusually) pouring rain outside and I loaned my truck to a friend. So, given that I had some power MOSFETs and a MRB-GIO sitting around, I decided to try building a prototype MRBus light controller. Turns out it was pretty darn easy, aside from some thinking about correct snubbing on the FETs to prevent inductive kick from killing them. I’ll post a schematic soon, but for now, I’ll show some pictures of the prototype. In the pictures, you’ll see the MRB-GIO, the breadboard with the power drivers and snubbers, my trusty Lambda power suppy, and then the test LED strip, showing all the different ways it can be turned on and dimmed. 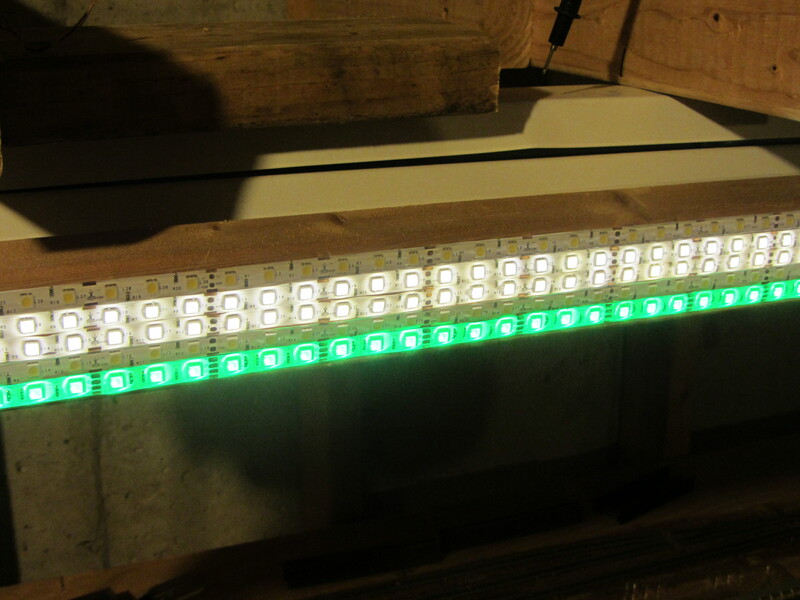 Then there’s also a couple photos of some early tests – I could just send intensities over MRBus to the controller, and lights would change. 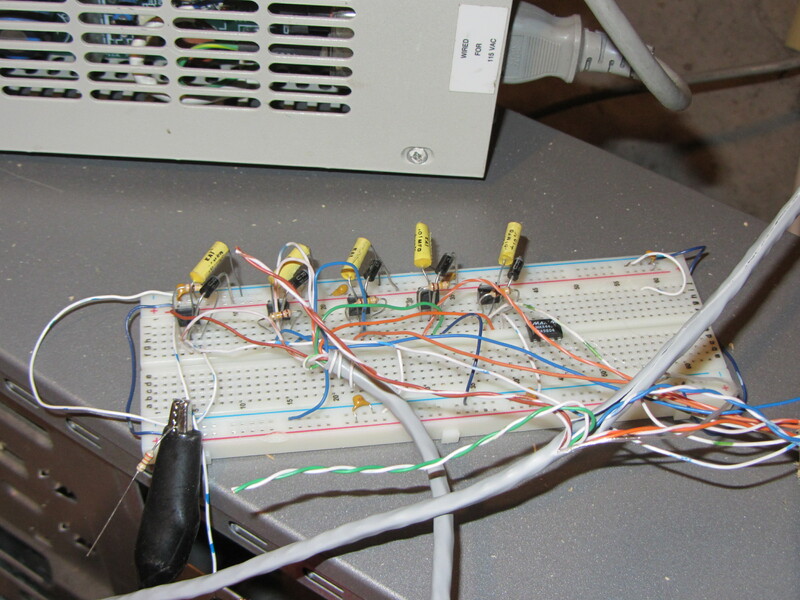 This entry was posted in Electrical, Planning on August 22, 2013 by ndholmes. 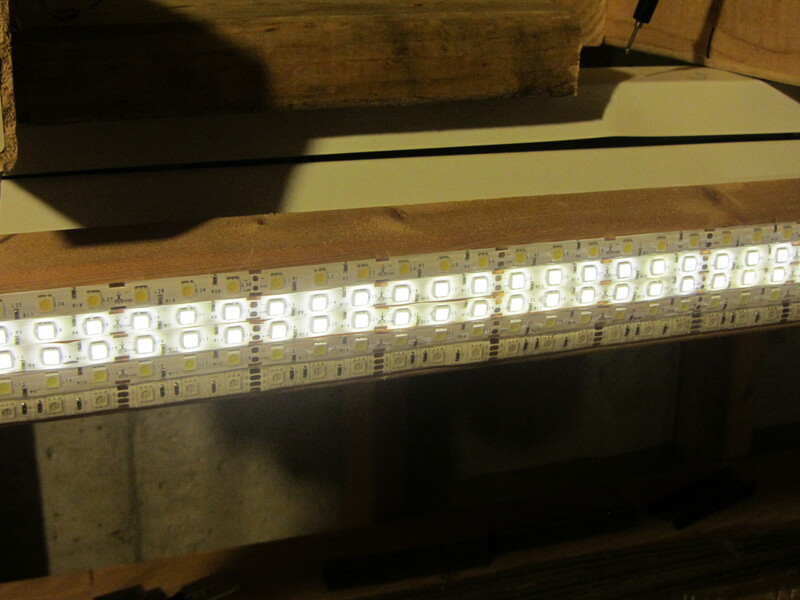 So last night, as I was trying out various LED strip configurations, I was trying to match my old fluorescent tubes in terms of illumination without regard to overall power consumption, cost, or anything else. Today, sitting at work, reality smacked me upside the head. 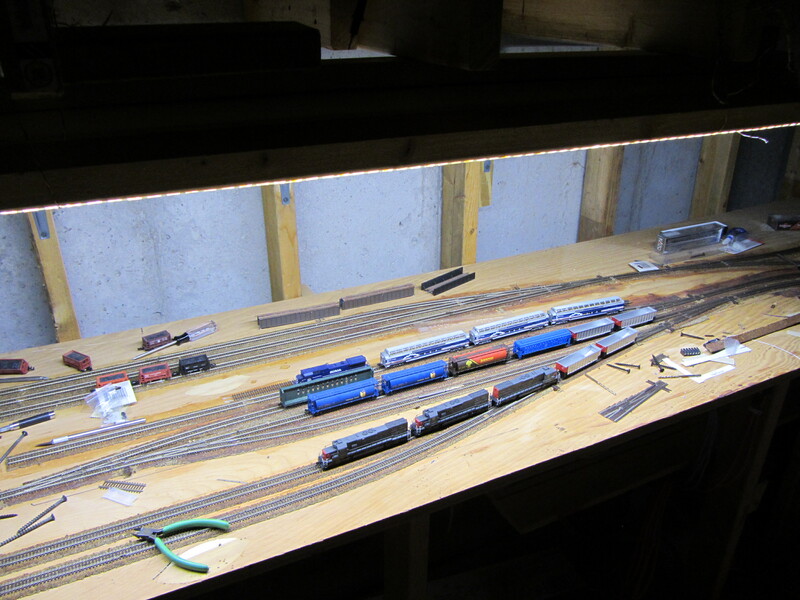 Each deck has approximately 110 feet of linear run, so 220 feet of lighting for the whole layout. 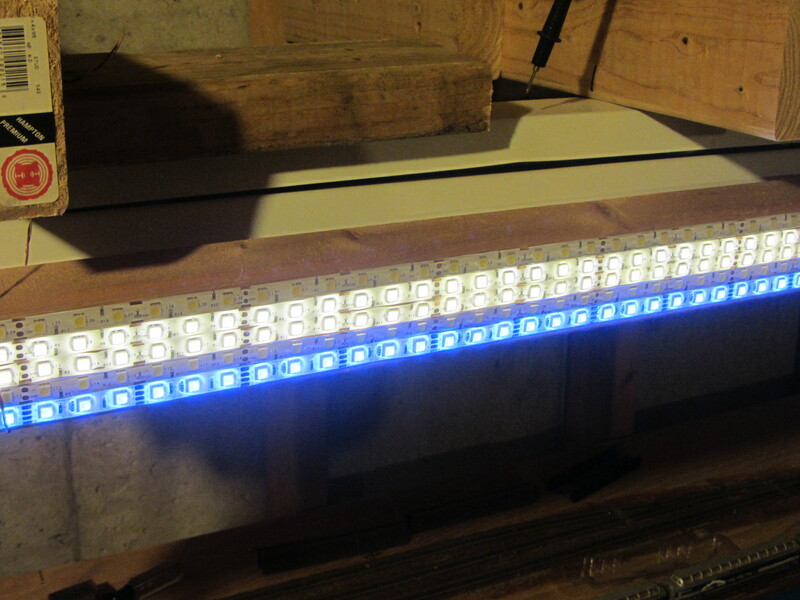 Assuming four strips of LEDs going strong for main lighting, that works out to 4.8A/4ft, or ~1.2A per foot. That’s 264 AMPS of 12 volt power, or 3.2kW. Yikes! Given at a 20A house circuit can only source 2.4kW under ideal conditions, that’s probably 2-3 house circuits just to light the layout. (Remember, any power supply isn’t going to be 100% efficient. In fact, 75% would probably be a good day. Then, unless it’s power factor corrected, that’s going to get even worse.) Given that my breaker box is buried in a finished wall, running new circuits would be painful. 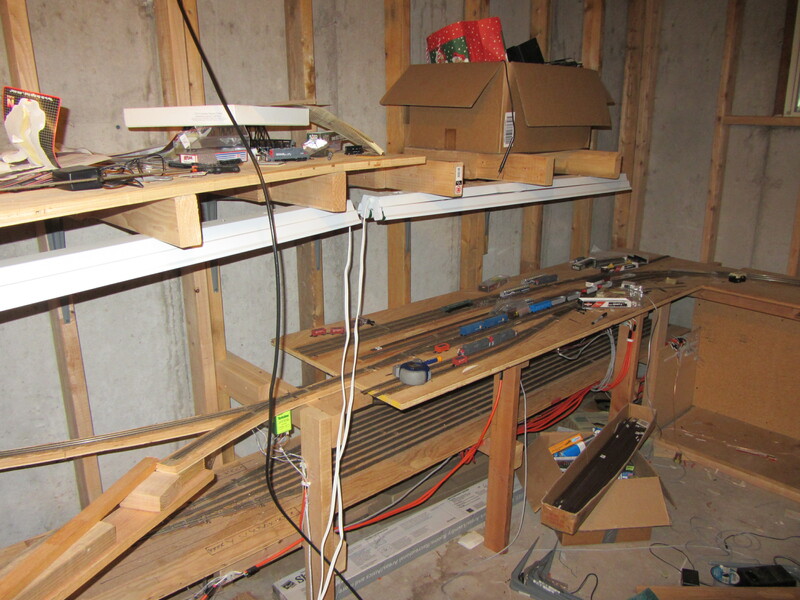 Now off to continuing to demolish the old layout and clean out the basement for new construction. 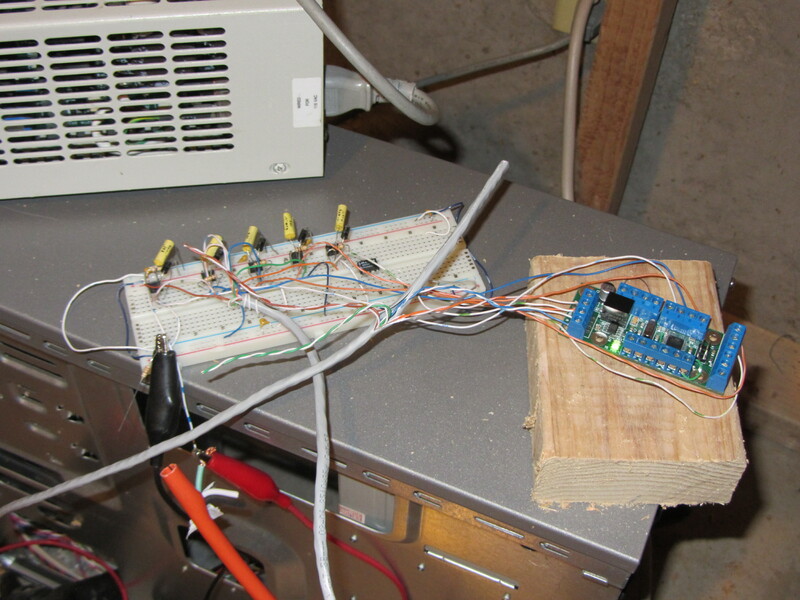 This entry was posted in Electrical, Planning on August 7, 2013 by ndholmes. 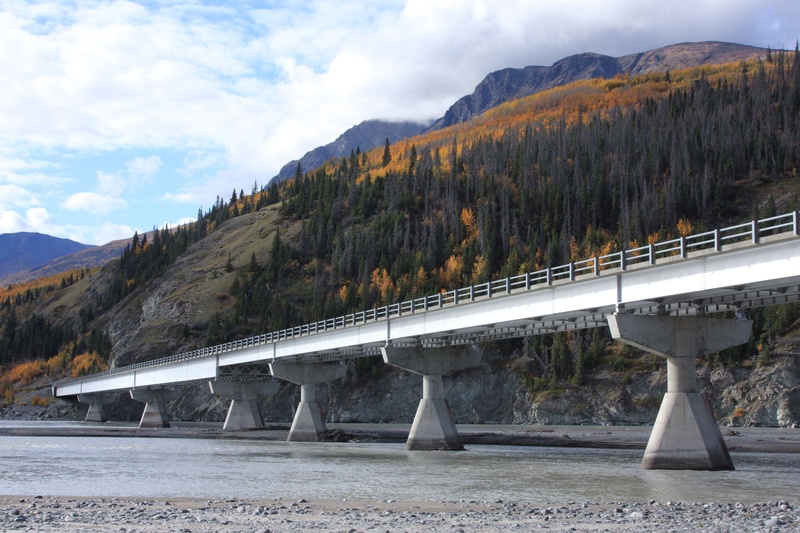 Here’s a last look at the start of the Canadian Arctic Railway, my fictional bridge line from Fort Nelson, BC, to Anchorage, AK. I started planning this line almost a decade ago, and began construction shortly after buying this house with my wife. Then she became my ex in 2008, and the railroad went into an seven year holding pattern. 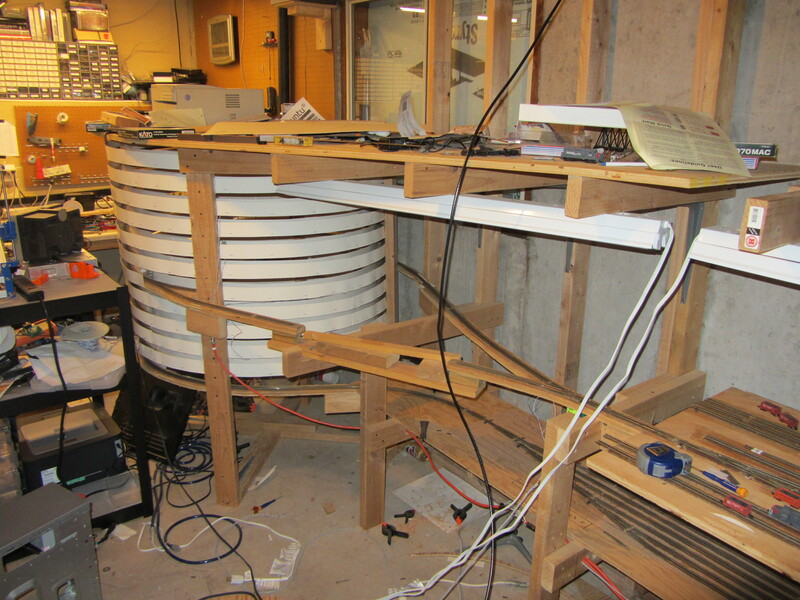 Tomorrow or Sunday, I’ll remove the upper deck and extend the wall framing out through the area the helix once occupied. Then comes the task of replacing the old heavy upper framework with a new, lighter open grid system. 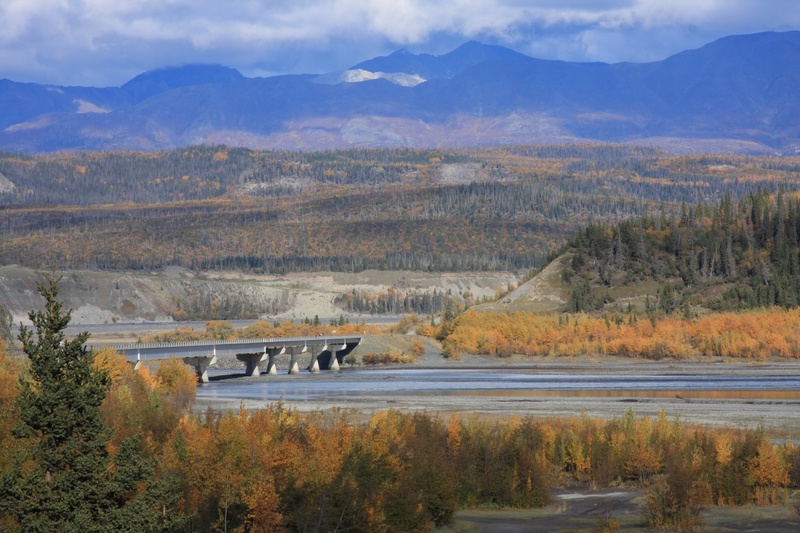 The bottom through this section will likely remain the same – Fort Nelson is being rebuilt as the main Cordova, AK, yard. All new construction on the bottom, however, will follow a similar lightweight construction method. I’ll also be installing a valence above the upper deck, and shelving below the lower deck. 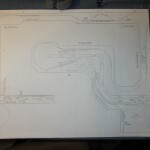 This entry was posted in Benchwork, Planning on August 2, 2013 by ndholmes. 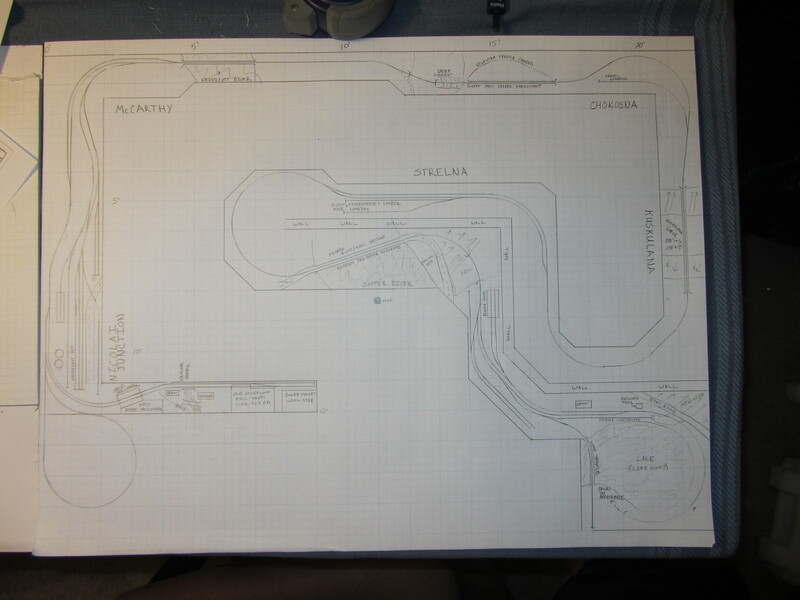 I started off this layout thinking I’d step into the 21st century and embrace CAD tools for track layout. I’ve often been described by my friends as “CAD-tarded”, because of my long-standing and complete inability to use CAD tools. I don’t know why, but the tools and I spend more time fighting each other than getting work done. I guess my brain isn’t wired that way. But, I figured with a fresh new project, this was the time to start trying again to switch from my old ways. I grabbed demo versions of many of the popular packages (CADrail, 3rd PlanIt, etc. ), or full versions, in the case of the free XTrkCad, and wound up beating my head against them for a full day before giving up. I just couldn’t get things to work, and the frustration was driving my creativity level to a new low. Well, there’s a Saturday I’ll never get back. So on Sunday, I pulled out my 17×22 quadrille pad, templates, compasses, rulers, and drafting pencil. I was so much happier. The creativity returned. I spent the entire Sunday drawing, and didn’t even realize that I’d been at it for 14 hours until I looked up at the clock at 2am. Oops. 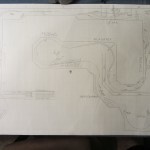 Here’s my initial sketches of a track plan, as captured by my little camera because I haven’t yet scanned them (they’re 17″x22″, a bit bigger than my scanner bed, so it’s going to take some work). Thoughts, comments? 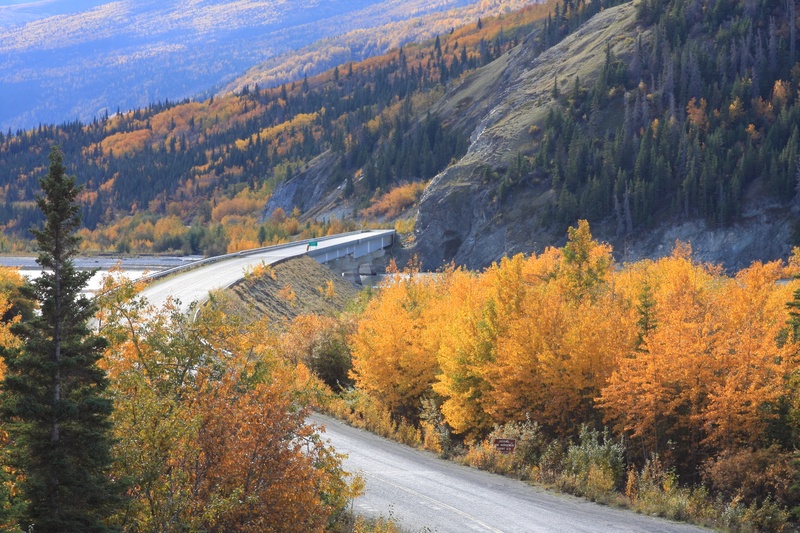 This entry was posted in Planning on July 31, 2013 by ndholmes.